Viper’s Bugloss is a biennial that produces brilliantly blue flowers with long red stamens in June. The funnel-shaped flowers start out pink, but then later turn dark blue. The oblong leaves grow up to 6 inches long, are dotted with small white dimples and covered with tiny white hairs. The stem is also hair-covered. In the first year, the plant starts out as a low rosette of leaves. In the second year, it produces a flower stalk that can reach 2 1/2 ft. tall. The plant dies back after it has gone to seed. The life cycle continues when new plants germinate from the previous year’s seed. The name Viper’s refers to the seedpods, which look like little snakeheads (vipers). The word Bugloss means ox tongue, and refers to the rough texture of the leaf. The unwelcoming name of the plant suits it just fine. The prickly, scratchy herb seems to be doing everything it can to discourage grazing animals from eating it. Among farmers this pasture weed is sometimes known as Blue Devil. 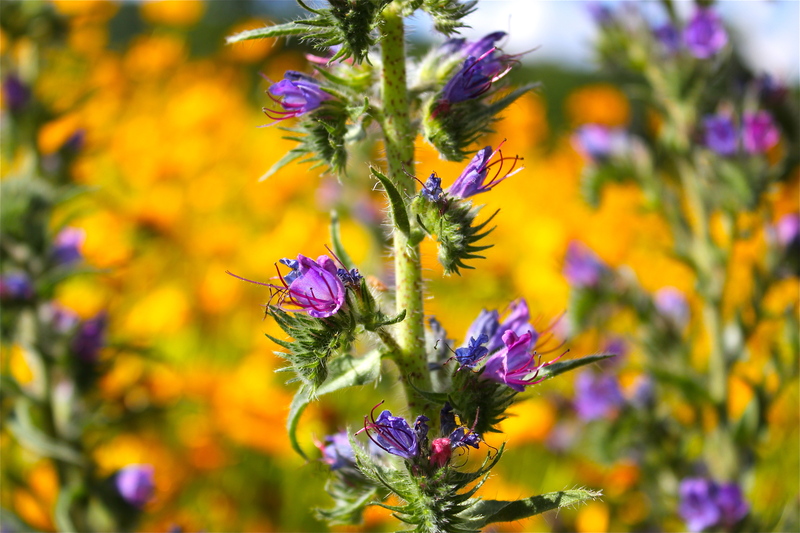 Viper’s Bugloss was originally brought to the U.S. from Europe for medicinal purposes. Then, it was used to treat snakebites. Now, it is mostly considered an invasive pest.